NOTE: Since I wrote this post & recorded my review video, Koho has updated their offer to give you even more $$$. Enter the code BRIDGET20 when you sign up to receive $20 instead of only $10! This is my totally honest Koho review! Koho is a Canadian spending and saving app that gives you insights into your spending behavior while helping you meet your financial goals. This review is NOT a sponsored blog post, but I do have a special affiliate code with Koho. If you use the code BRIDGET20 when you sign-up and activate your card, you’ll get a free $20 (and I’ll also get $20). Set up a direct load from your paycheque to your Koho card, and you’ll get an additional $40 — that’s $60 of free money! Once you’re signed up, you’ll receive your own code to invite friends & family and also receive the same bonuses when they sign up. A half-dozen subscribers asked me about Koho, and I figured the only way to give an honest answer was to try it out myself. At first, I didn’t get it. I really thought it was more or less a pre-paid Visa attached to an ordinary budgeting app. I didn’t see how this could possibly be better than using a cash-back credit card with your regular bank chequing account. However, once I started using Koho, I loved it and now it’s the only thing I use to spend money! Koho is a “spaving” tool. That’s a word I use to describe something that helps you manage both your spending and your saving. Koho functions as both a spending tracker and a bank account. You load money onto your Koho card by either directly depositing it from your paycheque, sending as an e-transfer, or transferring from a linked bank account. Once your money is loaded onto your Koho card, you can use it anywhere credit cards are accepted. Koho is powered by Visa, but it is not a credit card. It essentially functions as a debit card with all the conveniences (and none of the drawbacks!) of a credit card. Unlike a credit card, you cannot spend money that you don’t have — you can only spend cash you’ve actually loaded onto your credit card, so not only are you forced to plan and budget your spending, you also have to grapple with the reality that the money eventually runs out! If you love the rewards and convenience of credit cards but always get trapped in a consumer debt cycle, this is the perfect solution. Your Koho card is linked to the app, which will track and categorize your spending, as well as give you cash-back and help you reach your savings goals. Once you load money onto your Koho card, it will appear in the app as your “spendable” — in other words, how much money you have to spend. 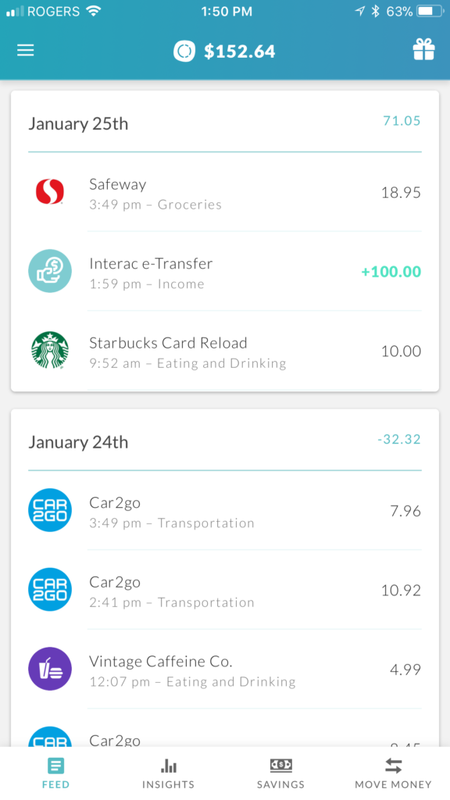 When you spend money with your Koho card, the app will track and auto-categorizes your purchases. This happens instantaneously! I see the Koho alert of how much I spent and where as soon as I tap the card to pay for something. If Koho has guessed wrong in assigning a purchase to a certain category, or you want to put your purchase under a different category for your own records, you can do that easily within the app. 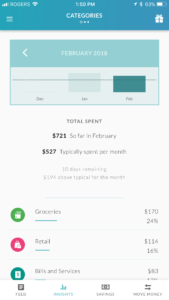 You’re also able to add any categories to better reflect your spending behavior and your personal budget. For example, I added the category “Baby” for any purchases I make for my little one. 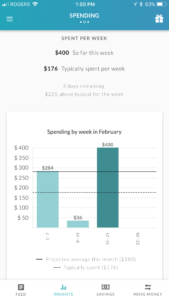 The more you use Koho, the smarter it gets, providing you with data on your average weekly and daily spending behavior. 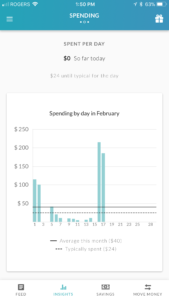 It calculates how much you usually spend in a typical week or day, and then also gives you a projected average based on your current behavior. It will let you know if you’re above or below average for the week or month, so you can adjust your behavior accordingly. Hands-down my favorite feature of Koho, and what really inspired this Koho review, is the micro-savings goals. Directly in the app, you can set a savings goal and then allocate a small daily amount towards it. This can be as little as a few cents, and every day it will be taken from your spendable and put towards your savings goals. If you’re like me and feel like finding an extra $500 in your budget is hard but saving $3 per day is not, you will love this feature. You can have as many or as few savings goals as you want, and set different amounts for each of them. Koho will tell you exactly how long it will take to save to meet your goal, and then you can adjust accordingly. I’m saving for frivolous things like designer jeans, but Koho’s micro-savings feature is also an excellent way to save for more worthy goals. For example, if you want to save a $1,000 in your emergency fund this year, you can do so in Koho by setting aside only $2.74 per day! In addition to Koho’s micro-saving, you will also receive 0.5% cash-back on all your purchases. This builds up in the app, and then you can choose to “power up” your spendable by cashing out. The direct load (direct deposit) function is the best way to get money on your Koho card, but depending on your employer this isn’t always easy to do. If your employer doesn’t let you deposit money directly to KOHO, you’ll have to use the direct transfer or e-transfer features in the app, which can delay getting your money onto the card. However, my experience with the e-transfers is they are always approved same day, usually within a few hours of me making the request, so it has not been hugely limiting but it does take some planning. Koho isn’t great for things like booking hotel rooms or other reservations where they will put a pre-authorization on your card for $400+ since this will be deducted from your spendable and thus leave you on a super strict budget if you didn’t put much in there. Likewise, because Koho isn’t a credit card, it doesn’t build credit, so if you were hoping to build or repair damaged credit, it won’t help you with that. 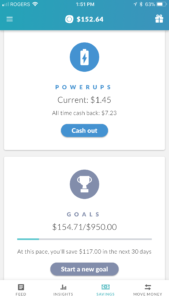 My personal discontents with the app, however, are extremely minor: I wish you could change the saving frequency under the goals to something other than “daily”, and I wish you could use your cash-back to power-up your savings goals instead of directing it back into your spendable! Honestly, you’ll enjoy the benefits of Koho as soon as you start using it, but there are some additional “hacks” I personally use that can make it work even better. My Koho review is not complete without the secrets to really make it work for you! making one of your savings goals something practical, like a boost to your Emergency Fund or Retirement savings, and try to save at least $1 per day. Once you hit this goal in Koho, cash out the goal and transfer the money to your appropriate account. Overall Koho is hands down the best budgeting app and fintech innovation I’ve seen recently, and it’s now a staple financial tool for my own money management strategies. 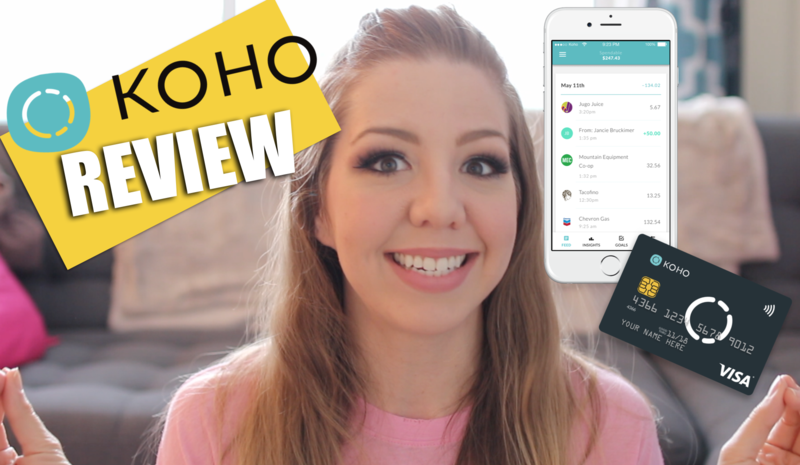 Hope you enjoyed this Koho review and like the app as much as I do! *This Koho review is not a sponsored post but does contain affiliate links. I receive a small payout when you sign up using my Koho referral code, BRIDGET20. Previous ArticleShould You Rent or Buy? Just got the Koho card after your review and I am loving it so far.. thanks for the review and leting me know about this card!